“No red lines” is the official line from Iraq’s leading figures and coalitions when it comes to the formation of the next Iraqi government, a process that could prove as tumultuous and controversial as events before the elections. If current estimates of the outcome are anything to go by, they will be. Estimates suggest a marginal lead for the Iraqi prime minister Nouri al-Maliki’s State of Law coalition, with Ayad Allawi second – though Allawi has failed to meet similar expectations in the past – and the Iraqi National Alliance (INA) a close third. The leading Kurdish bloc, theKurdistan Alliance of the PUK and KDP could come either third or fourth. This outcome – which would be the result of the sectarian vote being split – would mean at least a month of horse-trading and uncertainty as parties and blocks jockey for positions of power and concessions on outstanding disputes. Firstly, there are red lines when it comes to coalition building. It is difficult, for example, to foresee an alliance between Maliki and Allawi, who have had personal differences over the years and, to some extent, are still politically opposed. Talks have been ongoing between Maliki and the INA, though, since the pre-election period. This potential coalition will depend on whether the two can overcome the issue of who becomes prime minister, with the INA including a number of strong personalities all vying for the position and Maliki himself expecting to resume office. The Sadrists, for example, are perhaps the strongest bloc within the INA. 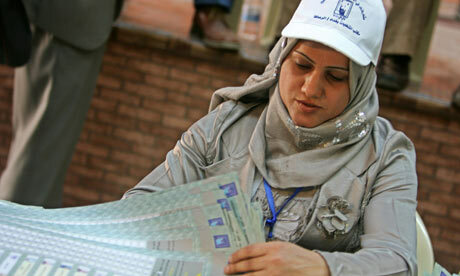 In the previous parliamentary elections, which also included Maliki, they won more seats than any other entity. They have fierce and uncompromising ideological positions, and have submitted their own choice for the premiership. The disintegration of the INA is a possible outcome and could lead to individual elements within the bloc seeking alliances of their own. Much of it, of course, will depend on the results. There is an agreement that the bloc with the highest number of seats will choose the next prime minister, but as one politician remarked to me, “we’ll see about that”. Further, entities within blocs can, if they perform poorly, be ditched to make coalitions with others possible or, if they do well, secede and forge alliances of their own. The Islamic Supreme Council of Iraq (ISCI) for example, could leave the INA and join forces with their traditional partners the Kurds, or even Allawi, to oust Maliki from office. Maliki, who has provoked the ire of his colleagues, is all too aware of the desire to have him removed from office. He will take comfort from what should be a strong showing at the polls but also the fact that there are few others who could take his place. The other real contenders are Allawi (the west’s choice for premier), Adel Abdul Mahdi of ISCI and the INA (who the west do not mind), the former premier Ibrahim Jaafari (running with INA, who will be fiercely rejected by the Kurds) and Ahmed Chalabi (running with the INA, who the US will do everything to stop from getting into office). Maliki may well turn out to be the compromise choice. Assuming Maliki does win and gets around 98 seats, he will then need another 65 MPs to reach the 163 seats needed to form a government. The Kurds, who previously held more than 50 seats in parliament, are the most sought-after coalition partner since they remain strongly united in Baghdad politics. A new Kurdish party, Change, has weakened the Kurdish front, but Change will only use its leverage in Baghdad to gain concessions in the Kurdish north. Assuming ISCI and INA performs poorly, the Kurds may be pushed towards an alliance with Maliki, since Allawi’s Iraqi National Movement (INM) might be too nationalistic a bloc and includes a number of unsavoury groups such as the Baathist al-Hadba party. Maliki has also recently opened up towards the Kurds, making positive references to the strength and independence of the Kurdistan region as well as relaxing central government control over the disputed territories. Nevertheless, the Kurds have indicated that they could work with anyone and everyone, even former Baathists, but for a price. It might be too early to expect concessions on outstanding disputes over land, oil and power, but they will seek the key ministries up for grabs, including the ministries of the interior, oil, defence and finance and will, at the very least, look to keep their existing ministries of foreign and water, as well as retain the presidency. It will then be up to the leading bloc to appease other entities to reach the threshold necessary for the formation of a government. These include the essentially Sunni bloc of Tawafuq, the Unity of Iraq Alliance as well as any groups that splinter from alliances such as the INA.